Swallow - The swallow, like the bluebird, is a symbol of hope. 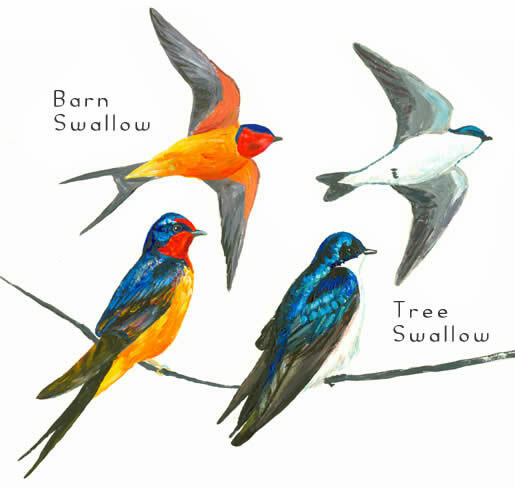 As a nautical tattoo design, the swallow has been sometimes mistaken within popular culture for the bluebird, and the two very different species of birds - the Barn Swallow and eastern Bluebird, to be exact - have quite similar colouring, with bright accents of blue and and orange, verging to both red and yellow. In ancient times, the swallow was associated with the 'imperishable' stars and the souls of the dead. According to Greek legend, secret texts told how to transform into a swallow, something the ancient deities liked to do. It was also a totem bird for sorrowing mothers who had lost a child. To kill a swallow was very unlucky, as the swallow carried the souls of children who had died. An ancient Egyptian artwork depicts a swallow on the prow of a barque as it enters the Underworld. 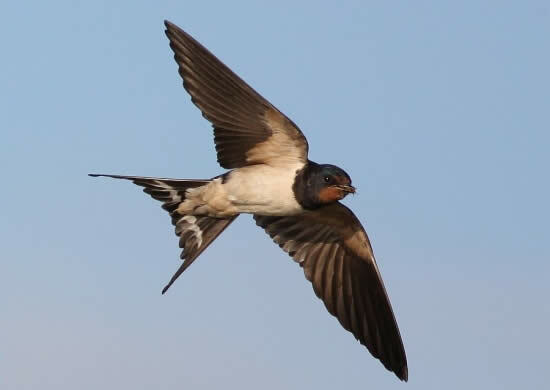 Interestingly, both good luck and bad are attributed to the swallow. It heralds the coming of spring and happiness, poets praise it, and it appears on the flowering peach branch in classical Chinese painting. In Egyptian love poetry, the swallow sings of the first signs of a new love. For some, it's a symbol of fertility and renewal, a harbinger of good and a symbol of transformation. For the pilgrim to Mecca, the swallow is the symbol of constancy and faith, and is said to fly to that holy city each year. Swallows mate for life, and therefore represents fidelity and loyalty, but in Japan, it can be a symbol of unfaithfulness. Some legends warn of a swallow flying through the house, since it brings tidings of displeasure from the gods, and likely foreshadows bad luck. In China it symbolizes daring, danger and a change for good in the future. For more than a century the swallow has been a favorite tattoo motif for sailors. It's often a sign that land is near. During migrations that can be thousands of miles in distance, swallows are known to travel far out to sea, but would alight on boats when close to land - a welcome sign for the sailor hoping for landfall. It's a tradition for sailors -- after logging 5,000 miles at sea -- to sport the swallow (or depending upon your belief, the bluebird) tattoo. Two swallows proclaims 10,000 sea miles. And a swallow with a dagger through its heart is a memorial for a friend lost at sea. 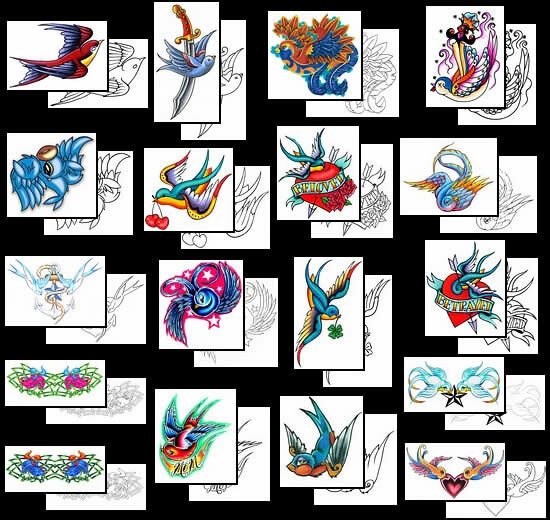 Choose your own swallow tattoo design from Tattoo-Art.com. Find the classic swallow tattoo design that is perfect for you. 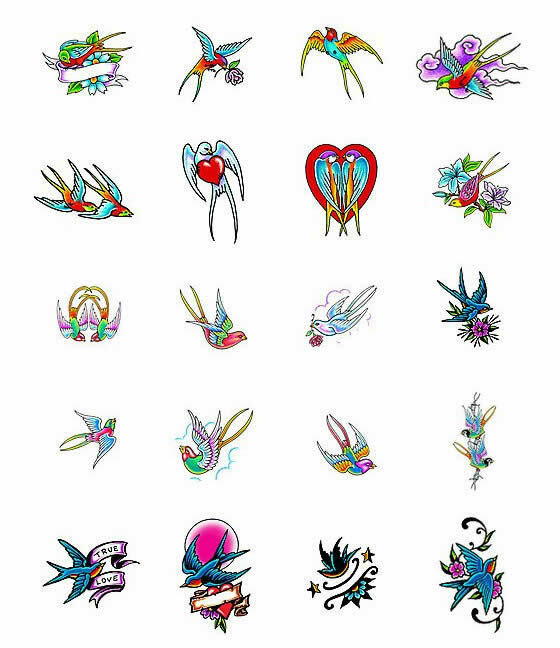 Choose your Bluebird/Swallow Tattoo Design from TattooJohnny.com.